Original music by a group of highly sought-after artists. Powerful melodies and lyrics. This trio will engage and inspire you with their 'telepathic' heart felt performances. Alive. Authentic. These guys clearly love making music together. 5. Where Did We Go? "I haven't purchased an album for myself in a looooong time....picked this one up last week and I simply CANNOT get enough of it. It is on contstant loop." -Amy King, producer/engineer Grant Avenue Studios. "Mark, if there is justice in the world (frankly, I'm not convinced, but if) your song 'Beautiful' will be a number-one-utter-legacy-lifetime-through-the-generations hit. Damn you for nailing every fear and emotion in one song; for perfecting lyrics that cover whole lifetimes. Every time I hear it, I find a new layer, a new viewpoint, a new reason to bawl my eyes out. I've imagined your daughters, your wife, my daughter, my self, my mother, the cashier at the supermarket, you... everyone. It's the 'everyone is beautiful' song! It's so great to see you get some of the recognition you deserve, Mark; but then again, I hope you know you're recognised in many ways, some of them less grand but no less meaningful. You rock, and I'm so glad you do what you do." 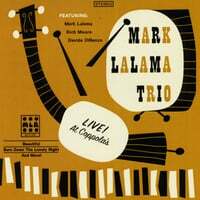 "I had such a great time performing with the Mark Lalama Trio. So musical: the playing, the singing, the song writing, the energy. It’s not a band for the faint of heart! And they play together like a band-not just musicians thrown together. It’s hard to believe so much sound is coming from just the three of them. They are the total package." -Guido Basso, instrumentalist (trumpet, flugel horn, harmonica)/composer/conductor/recording artist/Order of Canada recipient.